A team of Kathaakars who flew from India to US were warmly welcomed by Indians living in America. 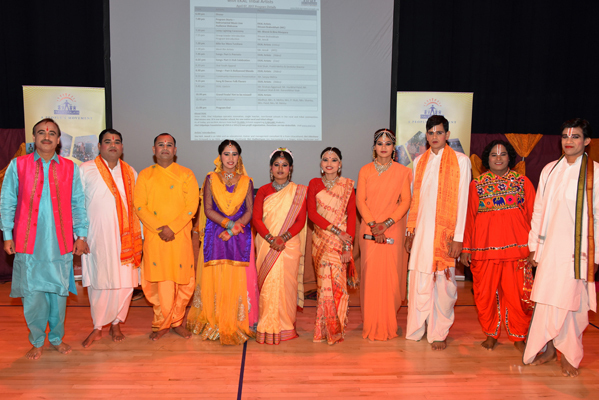 Through their very first programme, kathaakars enthralled the audience and they gained the impression that Kathaakars Programmes are connecting the hearts of the American Indians with India. Chicago witnessed the biggest event with 700 participants. In this programme Dr. Hashmukh Shah, younger brother of Sri Ramesh Shah, declared that he will take Vanaprastha, serve for Ekal, leaving his practice. It is Lord Rama’s miracle in awakening the love towards our Culture and Motherland, in the hearts of Indians living in America. On the 9th of April in Mumbai, birthday celebrations of grandson of Sri. 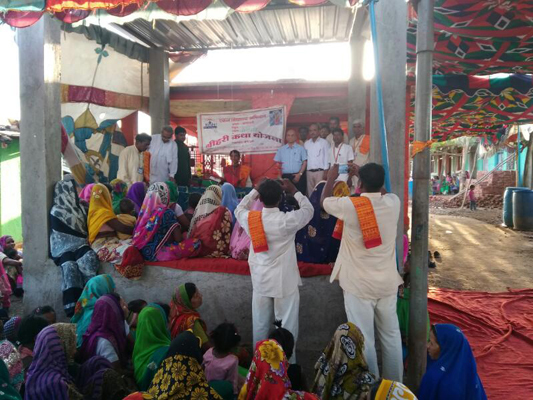 Satya Narayan Kabra, National President of Shri Hari Satsang Samiti, took place. A confluence of the top rich and 40 tribal kathaakars coming from distant tribal areas of almost all parts of India happened. 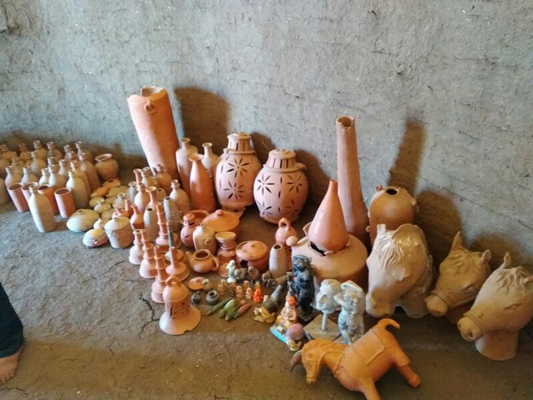 Mangal Charan, Swasthi Vachan, Quatrain poetry written in connection with Ram Navami and bhajans in connection with the birth of Krishna – all were rendered by tribal Kathaakars. They were given rousing applause and affectionate hugs. It was a wonderful sight of perfect harmony between the richest and the remotest tribal kathaakars, burying all questions of social status. Ekal Youth Leaders keep raising the bar! 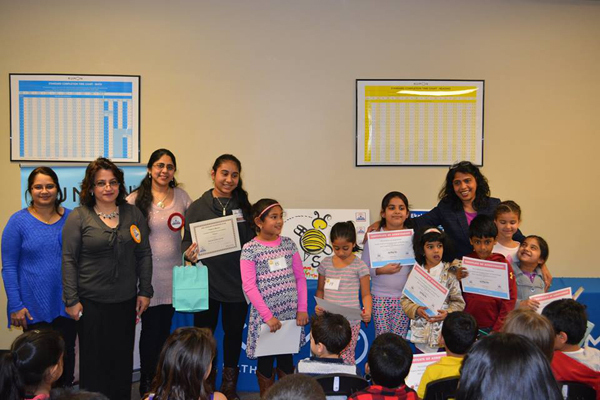 Ekal NE teamed up with Kumon Marlboro to do a Spelling Bee competition. 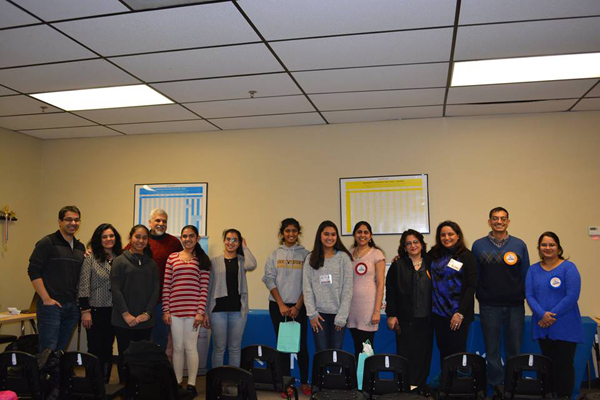 EYLs Sakshi Baldawa, Shanthni Ravindrababu, Krishnaveni Dole, Arya Swamy and Sinthya Kumar worked with their Kumon groups and executed a totally professional Spelling Bee in a very cordial and fun environment. FTS Mumbai members along with Mahila Samiti celebrated Ramnavmi, a religious and traditional festival with great enthusiasm at FTS Mumbai office. Flowers were used in decoration to symbolize the presence of nature amidst the fanfare. The presence of Lord Rama’s photo created an environment of peace and tranquil for all. Members attended this puja in good numbers. Tulsi, flower petals, fruits and mithai were offered to the Lord. Bhajans and Kirtans filled the ambience with devotion and purity. Everyone joined in Aarti followed by distribution of prasad and lunch. With the goal of developing Nanakmatta Sanch (block of 30 villages) in Udham Singh Nagar District in Uttarakhand into a model Sanch under its special initiative, Ekal Sansthan organized a three-day Arogya training camp for all the 30 Acharyas and key Ekal volunteers of the region. National Joint Coordinator, Arogya Foundation of India and Project Director - Home Remedies, Smt. Hema Malini’s training module consisted of subjects like healthy habits and lifestyle, basic human anatomy, science and culture, with special focus on primary health, anemia and malnutrition through home remedies. 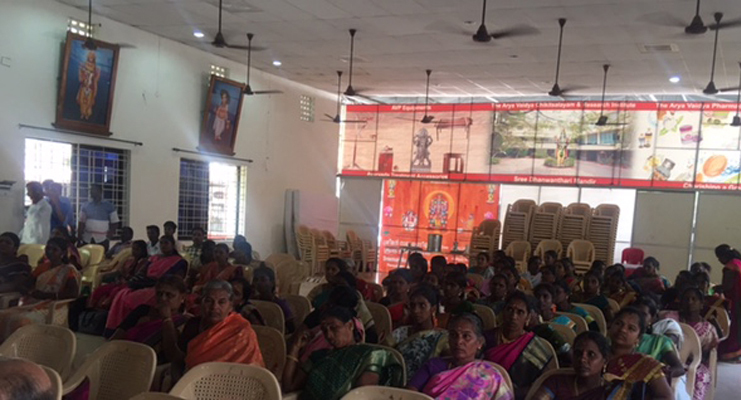 The trainees, mostly women, learned simple and effective home remedies for their regular health issues, menstrual cycle problems and issues faced by pregnant and lactating mothers. Samples of herbs and plants available in their locality were shown and special booklets on training module were also distributed to them. On 21st Mar’17, a meeting held between Arogya Foundation of India team and Smt. Shashi Shrivastava, Regional President of Mid-Atlantic EVFUS at EVFI office, New Delhi. She proposed to start one sanch of 30 villages (Sanch Gramothan Centre of Arogya) near Burman Midhli village in district Narasingpur, M.P. FTS chapter of Jabalpur found the place viable and Smt. Shashi committed to arrange finance for the whole project whose flagship programme is to Control Anemia. Dr.Harish Anand informed that Jabalpur Chapter is keen to start Ekal Vidyalaya in 90 villages including the 30 of the SGC (Sanch Gramothan Centre). Under Arogya Foundation of India Smt Hemamalini has created a dedicated team whose module includes home remedies (Dadi Ma Ke Nushke), which all of us have forgotten. From our kitchen and kitchen garden all our needs can be taken care of, without relying on hospitals. Namita Agarwal says that after attending the 7 days foundation course she personally applied the life style changes of home remedies on her and her family and the results were above expectations. The vision of healthy India has taken a concrete, remarkable shape! 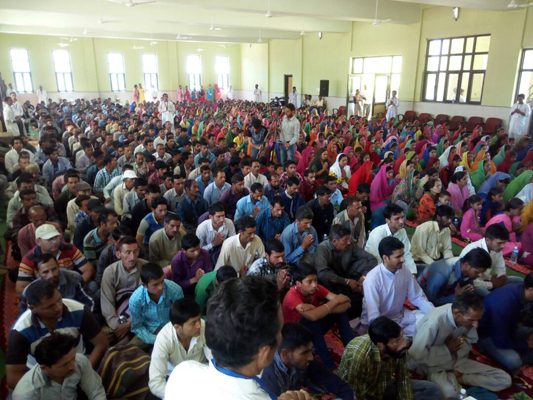 Thousands of people including women and children from 270 villages of erstwhile district Doda attended the Sammelan – which was a massive convention under the banner of Gram Swarajya Manch. 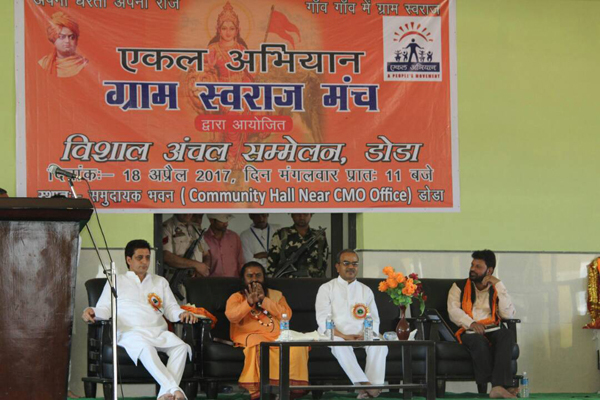 Sri Madhvendra Singh International General Secretary of Gram Swarajya Manch was the chief speaker of the program and Sri Shakti Raj Parihar, Hon'ble MLA Doda, was the Chief Guest while Mahamandleshwar Swami Divyanand Sarswati was the Guest of Honour on the occasion. Addressing the gathering, Sri Madhvendra Singh said Ekal is active in 55000 villages across the country and in Jammu and Kashmir there are 3600 villages where it is actively working for the welfare of rural population and there are more than 6500 volunteers devoted to this mission. Hon'ble MLA Doda was full of appreciation about Ekal launching pads of social programs, said it promoted the brotherhood between brothers and sisters, creating awareness among the rural people, besides imparting education. He also agreed to adopt twenty Vidyalayas. 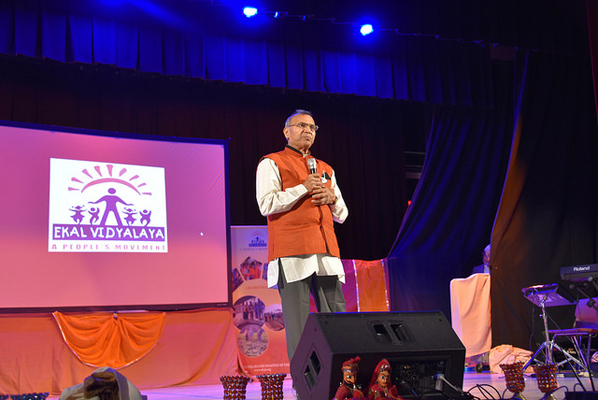 Swami Divyanand appealed to the audience to devote their deeds towards the development and welfare of the nation and the society. 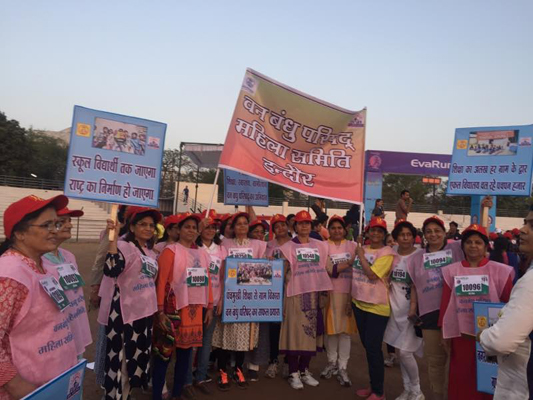 FTS Indore participated in EvaRun, a marathon only for women! As a group they walked to create awareness about FTS and also to raise their voice for a healthier life and awareness on breast cancer. 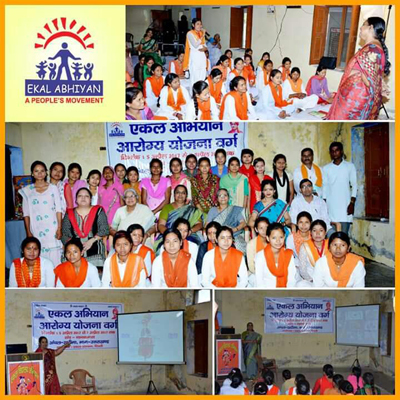 Ekal Abhyan is the second name for bonding bridge between urban and rural society. 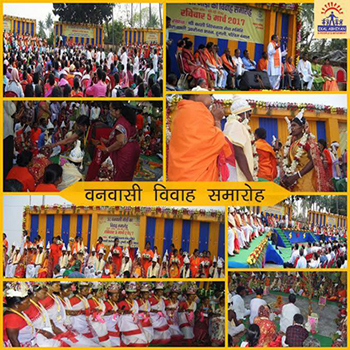 Sri Ashok Todi conducted similar wedding of 51 tribal couples from West Bengal villages on 5th Mar’17, before conducting the marriage of his son, as was done by Sri Ramesh Saraoji for tribal couples from villages of Ranchi in Nov’16. 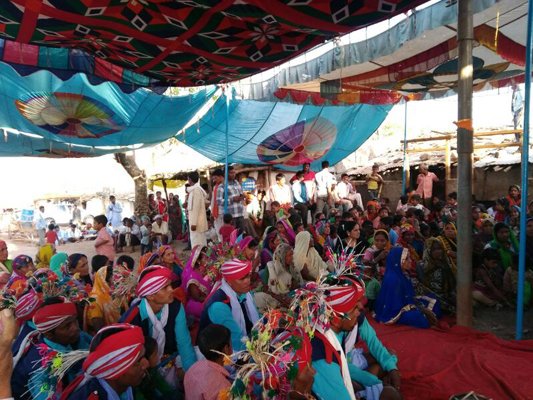 After the tribal marriages Pariwar Swavalamban was arranged enabling the newly married to live peacefully in villages and earn for their living. In the wedding function all the couples took oath to be away from addiction. Many of the family members and friends offered to organize such functions in future. A splendid dimension of Ekal Abhiyan! On April 11th and 12th West Zone FTS Chairman, Sri.Mananiya Shrigopal Pachesiya visited Amaravati Anchal. He visited Ekal Vidyalayas and Sanskar Kendra as part of inspection. 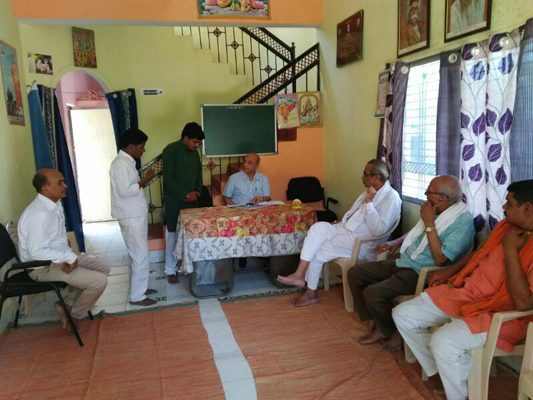 He was accompanied by Amravathi Anchal President - Sri Manohar Digvanii, Abhiyan Pramukh, Sri Kishore Hegde and Maharashtra Sambhag Pramukh - Sri Sanjay Malviya. 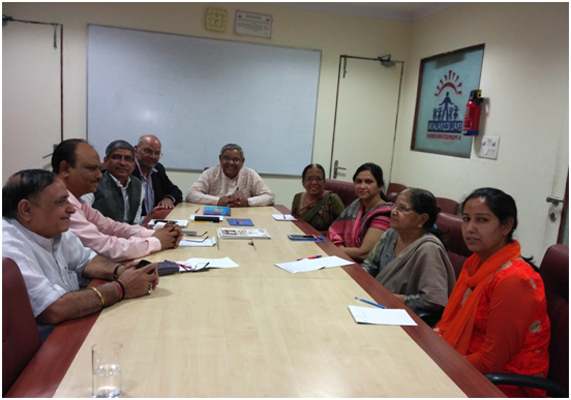 They had a discussion with FTS committee members of Amravathi Anchal on the final day.